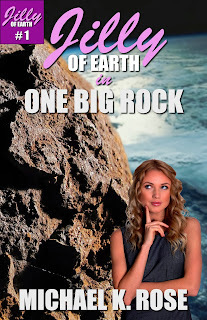 MYRIAD SPHERES: Introducing Jilly of Earth! Meet Jilly, Earth’s representative in the Galactic Command Committee. When a large piece of space debris mysteriously changes course and threatens the planet Korlan, she is summoned to a briefing aboard the Galactic Command Station. But as her alien partner Phil steps through a wormhole and into her bedroom, he finds her occupied with a new boyfriend, Jake. They must drag Jake along despite the sensitive nature of what he’ll see aboard the station and hope he won’t get into too much trouble while they’re sent off to save Korlan. However, this mission will be anything but ordinary, and before it’s over, Jilly will have to survive the greatest danger she’s ever encountered. “One Big Rock” is the first story in the fun, fast-paced Jilly of Earth series. Look for the next Jilly of Earth adventure, “The Abduction Blues,” within the month!